No question about it, we Israelis love our coffee. Not so much the grab ‘n go variety like at Starbucks . . . no, we like to savor it--sitting in a coffee shop, with a real cup, and maybe a slice of that cheesecake over there . . . So take a stroll out to Rechov Dizengof, or Sheinkin, or Ibn Gvirol. 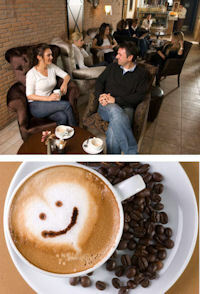 Pull up a chair and relax over a cup of coffee in your favorite beyt kafe. And don’t forget to tell ‘em Learn Hebrew Pod sent you!